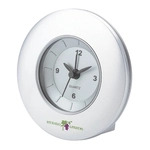 Elegantly enhance your promotional efforts with personalized desk clocks. Start giving your clients, employees, and customers the time of day. These promotional clocks make perfect gifts. They're both beautiful and practical, so they'll be proudly and prominently displayed on any office desk. Browse our selection of styles, sizes, and materials to customize a classic, timeless gift today. Triple the effectiveness of your next desktop promotion with this promotional desk clock that can be set to 3 different time zones. A matte silver logo desk clock that will be sure to keep you on time. This beautiful custom desk clock makes a wonderful gift to show your appreciation to your employees or clients. This elegant custom clock and business card holder is a notable desk accessory. A unique hourglass shaped promotional desk clock with two cones that rotate separately at different speeds. Anyone can appreciate an elegantly engraved desk clock. They're perfect for any organization or occasion – whether it's customer appreciation, employee achievement awards, or a special event. Our huge selection of styles, sizes, and accessories ensures that your logo will be professional. ePromos carries clocks made of wood, plastic, acrylic, leather, glass, crystal and distinguished metals like nickel, chrome, aluminum and silver plate for your organization. We use imprint methods such as engraving, etching, pad printing, and full-color printing to enhance your logo's aesthetics. If you're looking for something a little more useful, many of our clocks double as other accessories. We have clocks built into picture frames, pen cups, calculators, business card holders and more. Get in touch with our brand specialists to find out how to get started on your next promotional efforts. With our quick processing and delivery, we'll have your clocks ready right on time.